Used in manual trading to block losses on any price movement against a trader. Allows profits to grow as the price moves in the right direction. Can lock one position or grid. Helps other robots to reduce drawdown by locking. This robot is a development of the idea behind the popular robot Adaptive Lock. Instead of the traditional stop loss, the trader manually sets the line of the initial lock of this robot. The robot monitors the behavior of the price relative to this line. If the price goes against the trader, the robot locks the position (or several positions) with a counter order, which limits the loss as a stop loss. But this is better than a stop-loss, as it allows you not to lose position in case of any, even too large price movements towards loss. Closed at the right time, the lock allows you to return the lost capital in the subsequent return of the price to its original position, and also allows profits to grow as the price moves in the direction of profit. The robot provides all locking functions around the level set by the trader, ensuring that losses are minimized when the price moves in the direction of loss, and opens up the possibility of increasing profits when the price moves in the right direction. Lot multiplicity for the Lock - the multiplicity of the lot for lock. The robot can set the pending main order and the initial lock line itself (the "Automatic" market entry mode is selected) or wait for the trader to set the order or position manually ("Manual" mode). You can set several positions in one direction, and then turn on the robot. 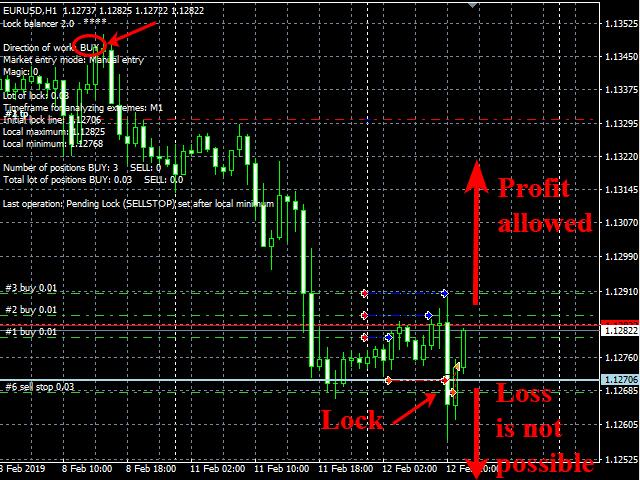 Orders (positions) should not have stop-loss, instead of stop-loss the robot will use a common lock. If the robot is used to insure the positions set manually, then you need to set Magic = 0, and set the mode to "Manual". If the robot is used to insure the positions set by another robot, then you need to set the Magic of these positions, and set the mode to "Manual". 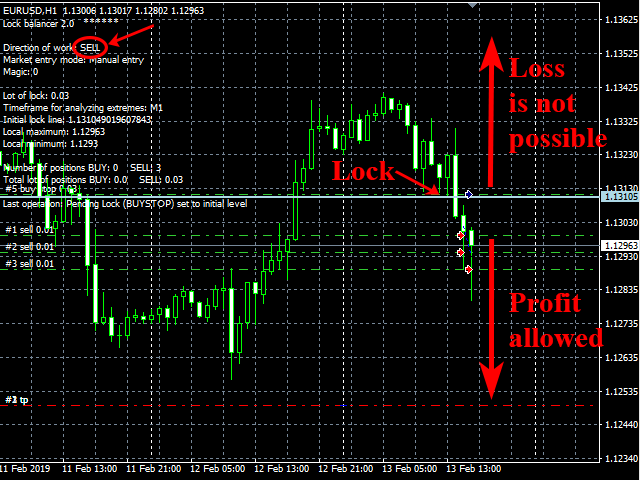 If there are market positions, the robot sets the pending lock at the level specified by the initial lock line. When the price moves towards loss, the lock will become market and will not allow the loss to grow. The price can go any distance in the direction of loss, but the loss does not increase. When the price returns to the initial lock level, the robot closes the market lock and sets the safety pending lock, which will allow you to return funds from the drawdown when the price moves in the direction of the profit and continue to make a profit. In case of price fluctuations around the established line of the initial lock, the robot moves the lock behind local extremes of the price chart near the line using a special algorithm to reduce losses. The position of orders and lines of the initial lock can be adjusted manually at any stage of trading, depending on the strategy of the trader. When all positions are closed by take profit or manually, the robot will automatically close the lock. The level of the initial lock should be set where, in manual trading, a stop loss would be set in accordance with the selected strategy. However, in order to reduce locking losses, one should strive to choose a level where the probability of flat formation is small. If during the work a flat is seen at the level of the initial lock line, leading to frequent lock triggering, it is advisable to move the line manually beyond the flat border. If you have questions, write me a private message. Always happy to help. Fixed minor inaccuracies in displaying information on local extremes.